Home / Blog / A night at the museum two! A night at the museum two! You might remember the blog I wrote a few months ago about Andrea and Ed who were getting married in the Manchester Museum, under the T-Rex skeleton? Well they did on Saturday 14th September, so I would like to congratulate the new Mr & Mrs Shaw. 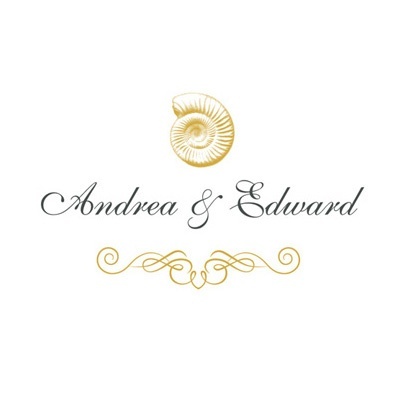 Andrea and Ed chose form the Love Invited Royal Elegance wedding stationery collection, however, they wanted to personalise it a bit and tie it in with their venue. I did this by simply replacing the crown with an illustration of an ammonite and removing the swirl design, which worked beautifully. Their colour scheme of charcoal and gold was also a perfect match to the day, keeping it simple and elegant. Their order consisted of a 6 page folded invitation with a tear off post card rsvp. This format is great as it gives plenty of room for additional guest information, without having to include lots of separate cards. Each invitation was also hand finished with a little diamate place on the front just under their names. For the day they dressed the room with simple double sided order of the day cards, detailing the running order of the proceedings, along with table numbers, menus and an elegant mounted table plan. Click to see the full Royal Elegance wedding stationery collection.